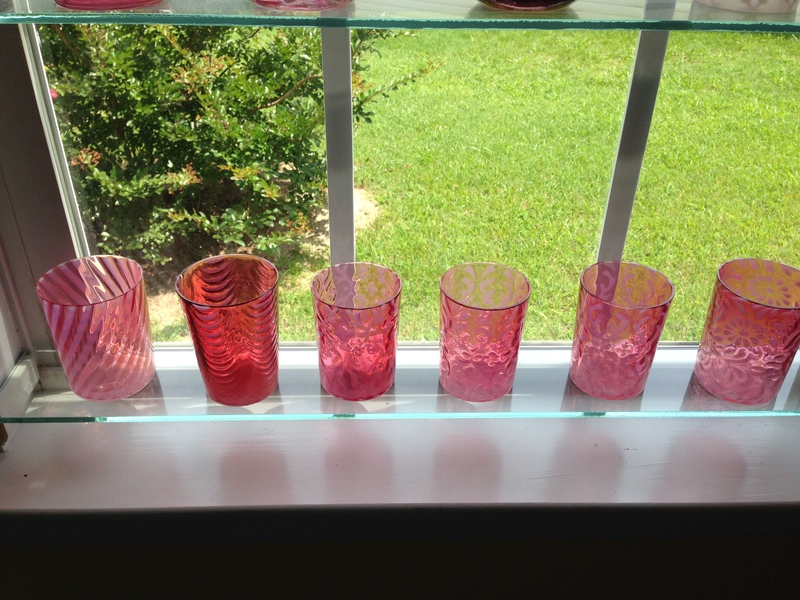 As an only child I inherited my mother’s collection of antique glass tumblers. They are certainly some of my favorite things. I love the light streaming through a window that shows them off. Wooden blocks hold the glass Several more pieces of my mother’s glass collection. (I’m the plate collector.) I’m sure you would agree that I am fortunate to have these beautiful things. 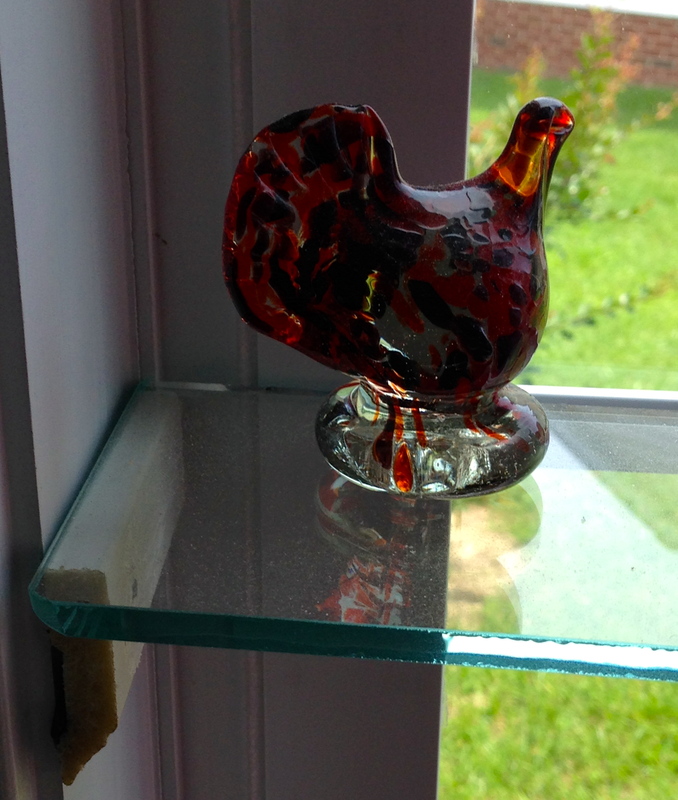 Think about a place to display some of your treasures where they shine. 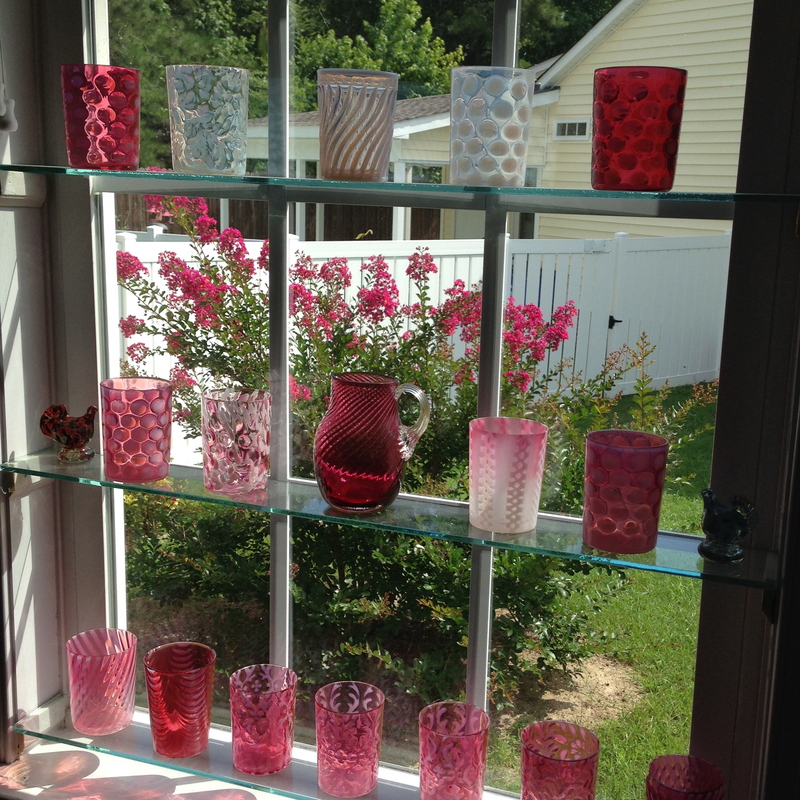 Your cranberry glass collection looks lovely in the window. Now if we could just come up with a way to keep them dust free. Darn, you noticed! I thought dust didn’t photograph well. No, no, no! I can’t see the dust on your glasses. I was thinking about my collection of blue bottles and how incredibly dusty they are right now. Ok, let’s be honest, how dusty my entire house is. Beautiful, Stepheny. 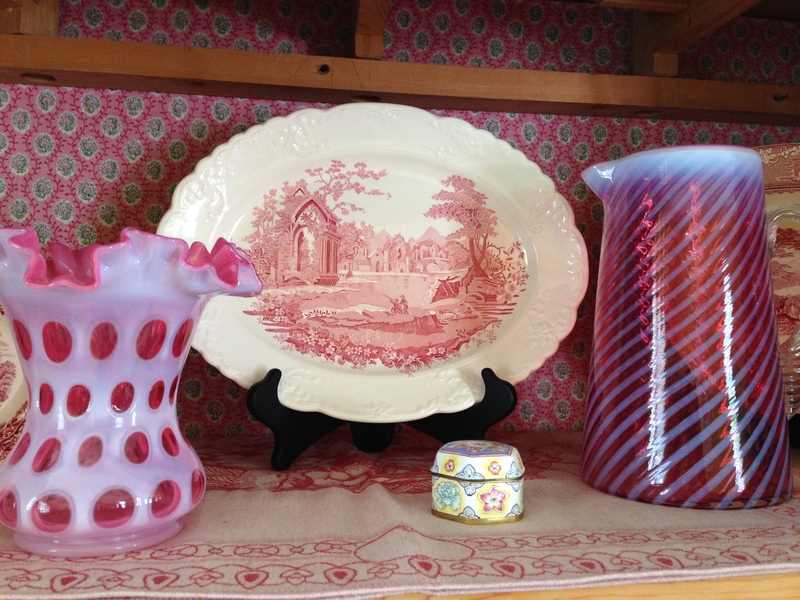 I love the way the light hits them; in the window is a great place to display them. Another source of light in my life that brings me joy. A beautiful way to enjoy your special heirlooms Stepheny. 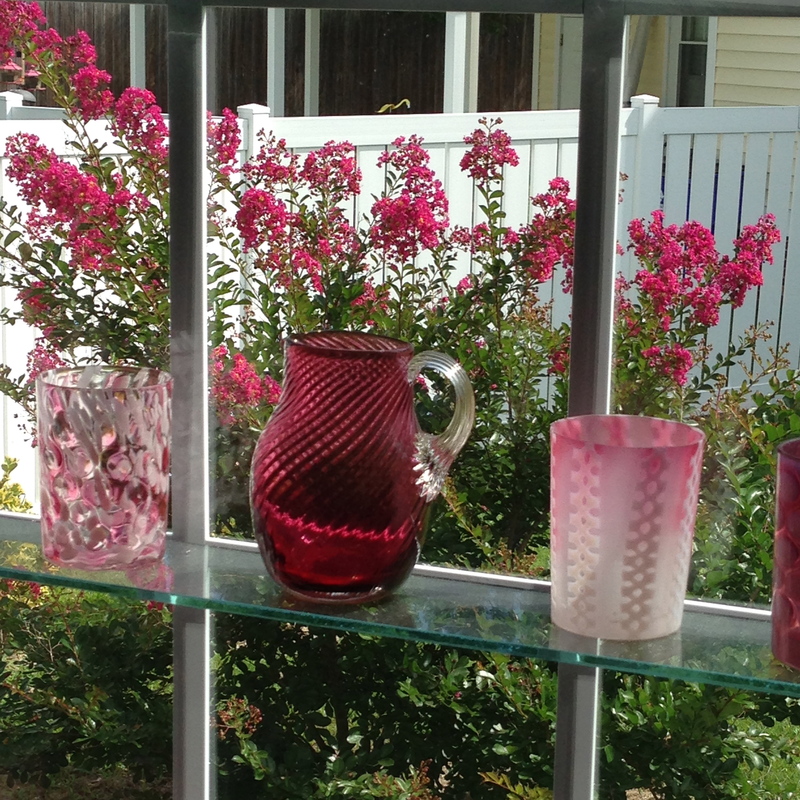 The crape myrtle makes a perfect backdrop against the window too. Count on my gardening friend to notice the backdrop. I purposely photographed it this way so the background would show. One of those serendipity things that brings us joy. Stepheny, this just charms my soul. You are such the artist in so many ways! Is the Cottage for Two near your home or elsewhere? The ‘Cottage’ is home. A move a year ago, sizing down, moving near a daughter, one floor, the whole scene accomplished. One of the best things is building another garden. Another best thing, a new friend like you! Stepheny, The rose bush beyond the window holding the rose cut crystal is more than charming! Be well Dear Heart! The crepe myrtle outside the window was planted before we moved into the ‘cottage for two.’ Perfect backdrop for the tumblers.